ALBUQUERQUE, N.M. -- A blown tire on a semitrailer may be to blame for a deadly head-on crash with a commercial passenger bus along Interstate 40 in New Mexico near the Arizona border, according to authorities. 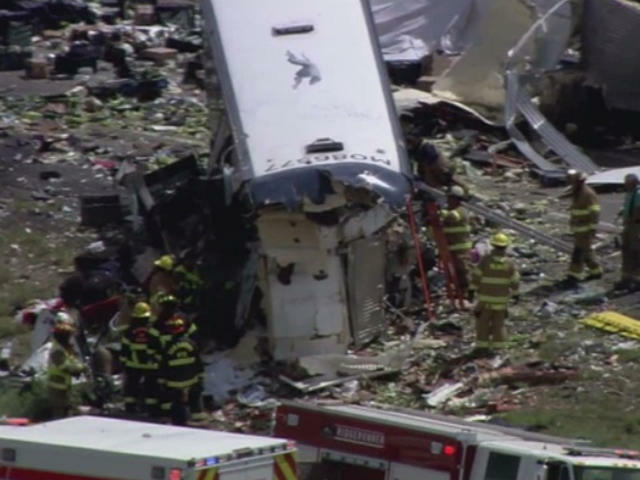 At least seven people were killed in the crash and many of the 49 passengers aboard the Greyhound bus were injured, although authorities couldn't immediately provide an exact count of how many were hurt or their conditions. The truck driver is expected to recover, reports CBS Albuquerque affiliate KRQE-TV. The crash occurred near the town of Thoreau. I-40 was shut down for nearly eight hours, says KRQE. Traffic backed up as travelers were diverted. New Mexico State Police said the semi was headed east on the freeway Thursday afternoon when one of its tires blew. They said that sent the rig, which was carrying produce, across the median into oncoming traffic, where it slammed into the Greyhound bus. It was heading to Phoenix from Albuquerque. "It was horrible," witness Marc Gonzalez told KRQE. "There was people trying to climb out of the windows of the bus ... bystanders trying to help people getting ladders out of their truck to get to windows of Greyhound bus to assist. "When we went by the overturned semi, everything in the trailer was out on the road. It was a disaster. ... You could tell people were in distress; screams were coming from the bus."